In addition to the ground-based air defence troops under the Air Defence Headquarters, the navy had its own anti-aircraft defence on ships and at coastal artillery forts. The small number of anti-aircraft weapons was successfully increased in autumn 1939 and during the war. In the first stage of the war, the deployment of air defence troops focused at the rear of the frontline troops and on the home front. The ground-based air defence of the frontline troops was improved during the war. The reported number of enemy aircraft brought down by the air defence was higher than the number shot down by the air corps. Air defence was established as a military branch not long before the Winter War. At the start of the war, the air defence forces primarily comprised fixed and mobile anti-aircraft batteries and anti-aircraft machine gun detachments. Almost all air defence units were committed to the protection of railway routes as well as industrial and population centres. The frontline forces had practically no protection against aerial attacks. The anti-aircraft guns and machine guns that arrived in Finland after the additional refresher training, i.e. mobilisation, and prior to the start of the war enabled the improvement of the air defence of the frontline troops during the war. Units formed of the anti-aircraft machine guns were deployed to protect the frontline troops who were engaged in battle, while units formed of the light anti-aircraft guns were deployed to protect the troops deployed directly behind the front lines, i.e. the reserves. In addition to the ground-based air defence forces under the commander of air defence, i.e. the commander of the air force, Finland also had naval air defence forces. The Finnish Navy had a reasonable number of anti-aircraft weapons, compared to the weaponry of the ground-based air defence forces. The navy had a total of twenty-five 75–76 mm and twenty-nine 40 mm calibre anti-aircraft guns on board ships and in forts. It had a total of thirty 7.62 mm calibre anti-aircraft machine guns. At the start of the additional refresher training, i.e. mobilisation, in October, the air defence troops had twenty-eight 76 mm, nine 40 mm and twenty-four 20 mm calibre anti-aircraft guns. They had 125 anti-aircraft machine guns. These equipment numbers were far too small for the required operations. The air defence forces were responsible for the air defence of the field army, i.e. the frontline troops, as well as the home front. The field army’s basic units, i.e. divisions, had no air defence of their own. 61 to 135. Finland was able to procure forty-four 40 mm calibre Bofors anti-aircraft guns from Sweden and thirty 20 mm calibre anti-aircraft guns from Germany (BSW). During the war, the number of anti-aircraft guns again more than doubled, increasing to almost 300. The City of Turku was able to buy nine 75 mm calibre Bofors anti-aircraft guns from Sweden for the city’s protection. Another seventy-two 40 mm calibre Bofors anti-aircraft guns procured from Sweden arrived in time to be used at the front during the war. Finland procured a total of seventy-six 20 mm calibre anti-aircraft guns that were suitable for low-altitude air defence: Eight from Sweden and Denmark (Madsen), 48 from Italy (Breda) and 20 from Germany (BSW). A total of 44 Finnish 7.62 mm calibre anti-aircraft machine guns (VKT) were manufactured during the war. Not all the procured weapons arrived in time to be used during the Winter War. Twelve 76 mm calibre Breda anti-aircraft guns procured from Italy and twenty-four 76 mm calibre Vickers anti-aircraft guns procured from the United Kingdom arrived in Finland after the war. At the start of the war, three army corps of the field army and the North Finland Group had practically no protection against aerial attacks. The area of the Army of the Isthmus, where two army corps were deployed, only had one heavy anti-aircraft battery and one light anti-aircraft battery in the first stage of the war. There were two anti-aircraft machine gun companies in the army’s area. There were more ground-based air defence units at the army’s rear. Viipuri was protected by three heavy anti-aircraft gun batteries and two anti-aircraft machine gun platoons. One anti-aircraft machine gun company was deployed in the area north of Lake Ladoga, primarily in the area of the IV Corps. The North Finland Group, which operated in the area of Northern Finland, had no air defence forces. One anti-aircraft machine gun platoon was subordinated to the group in December. The Swedish voluntary force that arrived in the Salla area included an anti-aircraft company that was equipped with four 75 mm and twelve 40 mm calibre anti-aircraft guns. They arrived in Finland in January at the same time as the Swedish F-19 Flying Regiment. The air defence of the army corps was strengthened during the war. In February, the Finnish military sought to subordinate an anti-aircraft detachment to each division. An anti-aircraft detachment included two 20 mm calibre anti-aircraft guns and two 7.62 mm calibre anti-aircraft machine guns. Strengthening the field army’s air defence resulted in the field army being protected by twice as many anti-aircraft weapons as the home front at the end of the war. 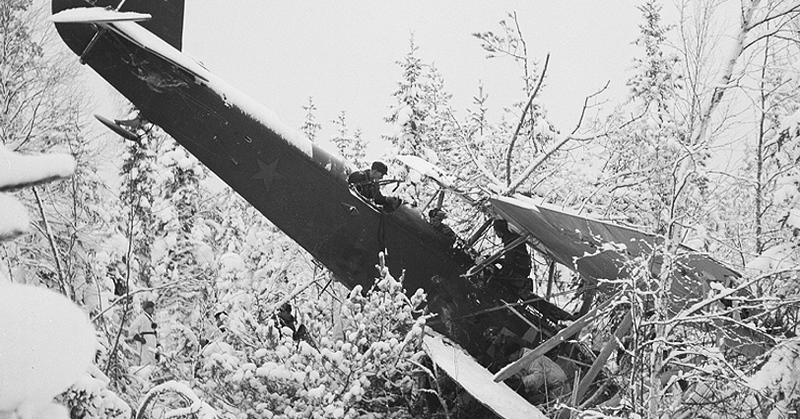 A Soviet R 5 aircraft brought down by an anti-aircraft machine gun of the Suistamo (Suystamo) airfield on 7 January 1940. SA-kuva. According to Ahti Lappi, who has researched air defence, the air defence forces deployed in the field army’s area recorded that they had brought down 280 enemy aircraft. This accounted for approximately 90% of the more than 300 aircraft brought down by the air defence forces. The number of downed enemy aircraft reported by the air defence forces was greater than the approximately 200 instances of downed enemy aircraft reported by the air force. The ground forces reported that their own air defence operations had brought down 49 enemy aircraft, while the naval air defence reported that it had brought down 41 aircraft. According to the research of Ahti Lappi, the Soviet Union conducted more than 84,000 flights during the Winter War. At the front lines, the Soviet Air Force supported the offensives of the ground forces and launched attacks against troop transport and rail transport at the rear. The aerial operations focused on the Karelian Isthmus. Approximately 60% of all flights, i.e. approximately 53,000, were conducted there. A total of 27,000 of them were bombing flights. When supporting the attack, the aerial operations extended to a depth of 6–8 km from the front line. The Soviet Air Force supported the large-scale offensive that was launched on 11 February with approximately 1,000 flights per day. The main targets on the home front were railway junction stations, railway bridges, airfields and ports. Cities were bombed with the aim of weakening the civilian population’s morale. Soviet aircraft conducted over 2,700 bombing runs and bombed 69 localities. According to Ahti Lappi’s research, the Soviet Air Force destroyed 200 locomotives and 2,000 railway wagons.